The Owlet was a revolutionary tool, created to help parents feel some peace when stepping away from a sleeping baby. Now they have an Owlet Cam that will help them feel like they are still there. SO many of my readers have bought the Owlet, and then asked me what I thought they should do as far as a video monitor. And now, I have your solution. I am a big fan of having ONE app to check when you need to do something — and now, with the Owlet, you can do just that! Full Disclosure, I have been an Owlet affiliate for a long time, and they did send me an Owlet Cam to check out. I’m going to share some of the specifics of the Owlet, how it pairs with the sock and then at the end I will give my final opinion of it it’s worth it or not! What is the Owlet Camera? The Owlet Cam streams HD 1080p video with night vision and two-way audio to your smartphone using a secure, encrypted WiFi connection. It can help you stay informed of your baby’s needs with background audio. Integrates seamlessly with the Owlet Smart Sock in the Owlet App. I found the image on the is REALLY clear. It is better than our other security cameras, so that is really nice, especially if you want a very visual check-up on baby, see if they’re breathing or whatnot (not quite as important if you have the Owlet sock on them). You can put the Owlet on a piece of furniture (like a dresser) or, you can mount it on the wall with their magnetic mount. Ok, so I think this thing is REALLY strong. However, being a girl who had babies in California (read: earthquakes) — it still makes me nervous to mount anything above my babies. However, I gave the owlet a pretty good shake from the magnetic mount, and it stood still. So, that’s good news! Please note, there is no moving or “panning” with the Owlet cam — where you leave it is what you can see. So, make sure you have it in the spot you want it. 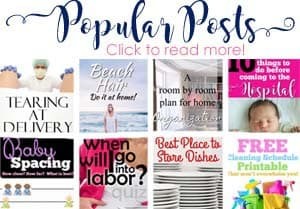 The Owlet is something I have reviewed extensively — and I have a very popular post that shows you how to save on the Owlet and if I think it’s worth it, if you can afford it. In a nutshell, The Owlet sock tracks your baby’s heart rate and oxygen and will alert you if it gets outside set boundaries. 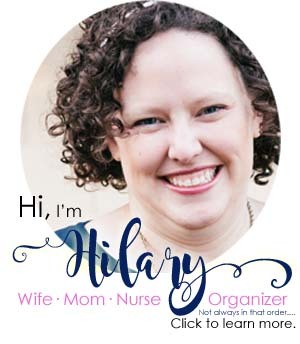 While nothing can prevent sids, it is similar technology to what we use in the hospital (I’m an L&D nurse) to make sure babies in the NICU are safe. The Owlet Sock is what most people call “The Owlet” — it’s a sock that has an app that can alert you. 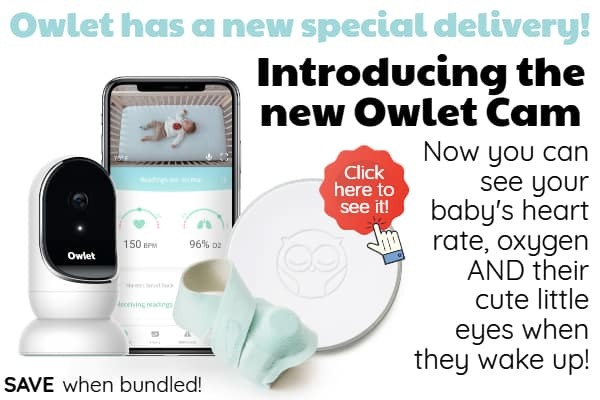 Why would I want an Owlet cam? Can I save on an Owlet Cam? YES, while the Owlet Cam is a BRAND NEW product, you can save by buying it WITH an Owlet Sock. The bundle saves you just about $50! Note: The Owlet Cam is currently only available in Pre-order — that means even if you order now, it’s still going to be a few months before your sock ships. They’re guessing 10-12 weeks from the launch of November 13th. If you order the bundle, they will ship your sock ASAP (and ship the camera when it comes in). 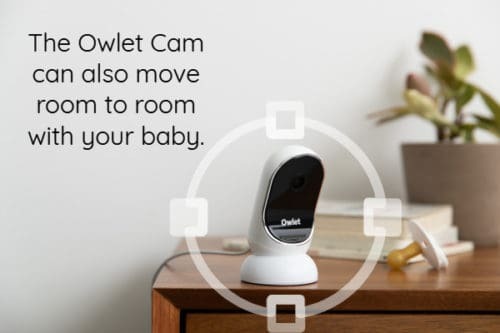 Will I only use the Owlet Cam with my baby? How easily is the Owlet Cam hacked? The Owlet Cam uses a secure wifi connection. The only way you can access it is via the app. So, make sure that you have a distinct password that can it safe. Can I talk to my baby with the Owlet Cam? Yes! There is two way communication wtih your baby through the Owlet Cam! When will my Owlet Cam be shipped? The Owlet Cam will ship 10-12 weeks from November 13th. 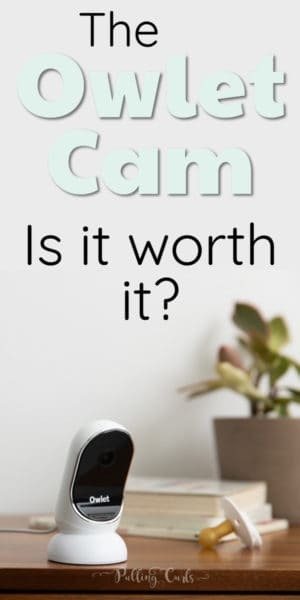 If you purchased the Cam as part of Smart Sock + Cam bundle, your Smart Sock will ship immediately after the order was placed. What is the difference between the Smart Sock + Cam vs. just getting the Cam? The Smart Sock allows parents to do more than hear and see — know if baby is okay. The Smart Sock tracks heart rate, and oxygen levels. These two products integrate seamlessly in the Owlet App as a comprehensive monitoring solution for complete peace of mind. Do you have to own the Smart Sock to use the Cam? You do NOT have to own the Smart Sock to use the Cam. The Cam works great alone. However, you will not receive heart rate, or oxygen levels without the Smart Sock. Owlet recommends pairing the products together for the complete baby monitoring solution. Can I use my HSA/FSA to purchase the Owlet Smart Sock + Cam? Yes, HSA/FSA can be used for the Owlet Smart Sock + Cam. Additionally, you will recieve $ off when you purchase these products together. You can not just purchase the Owlet Cam with your HSA/FSA funds, though. 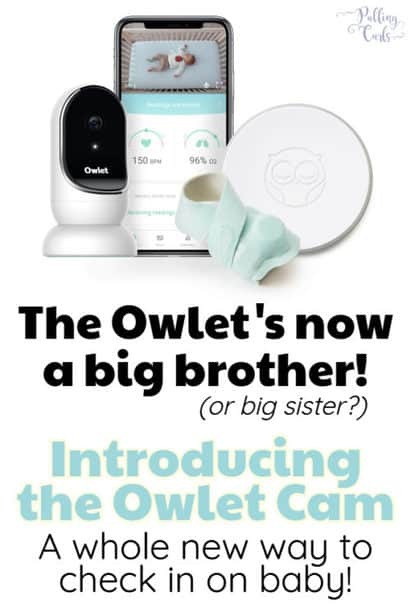 Why would I want the Owlet Cam? Will your child still grow-up happy and healthy without it — yes. Keep in mind — nothing can prevent SIDS as we don’t know what causes it, but the Owlet can monitor the heart rate and oxygen. Parents say that it gives them peace of mind when they feel anxiety about leaving their child alone sleeping. But frankly, you HAVE to leave them alone sleeping, because you need to shower, and get something done. 🙂 #GoNewMoms! 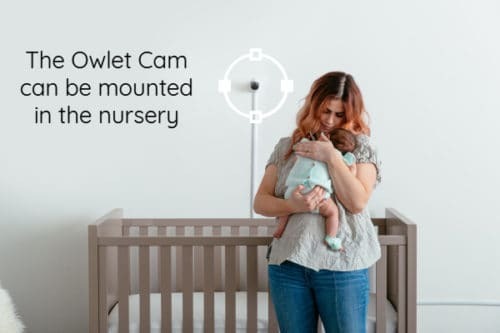 If you want more info about the Owlet (who I think still is the star of the show — the Owlet Cam is just an awesome bonus) — I’d recomend my Owlet Review to learn more. What did I think of the Owlet Cam? — My Final Opinion! However, in summation. I am not 100% sure the Owlet Cam is worth it on its own. The BIGGEST perk to the Cam is the fact that it’s integrated with the Owlet Sock. Cocoon Cam — has breathing monitoring as well for around $150. This one is secure because you use your own little monitor to view your baby (no wifi monitoring to worry about). This one is pretty darn cheap, but likely isn’t as clear or secure. I am a fan of the Owlet. I don’t think any other monitoring system really monitors the real time access to the baby. If you have a lot of concerns about leaving the baby alone (in a safe crib, you never want to leave the baby alone on your own bed, etc) — then the Owlet might be a good option (especially the refurbished one). And, if you have the cash the Owlet Cam is a great addition! Do you know know if you can use FSA funds to purchase the Owlet Cam if you already own the Owlet sock? New parents should absolutely get the bundle. Wish they had this when my little girl was born; it’s pretty great and integrates very well. We’ve gone through quite a few different video monitors, and settled on the Nest cam for our video needs originally. Still used the sock every night, though! Now switching over for the baby room to this.